Looking out over the sheltered waters of the Comox Bay, is there a better place to experience the ocean and all it has to offer?a Summers are special here because the window for a warmer feeling ocean closes quickly. By harnessing the wind or mastering the paddle, take advantage of this fleeting season under your own power. The Comox Marina is a hub of ocean activities and a great place in which to experience, discover and grow. New educational opportunities give our children the values and life lessons offered by the sea in this ocean playground. This is a community where downtown merchants embrace the value of our location embodying their mantra “Comox by the Sea”. There is a true sense of community growing in this marina—from weekly events for paddling enthusiasts, to a water sports centre offering world class programs. This is truly a hub of ocean sport activity. The secret is out! More people are discovering the beauty and ease of access available to us in the valley. The beach dubbed “Little Mexico”, tiki hut included, has been attracting boat born beach goers for years, and is becoming the local hangout for Catamarans and stand up paddle boarders alike. 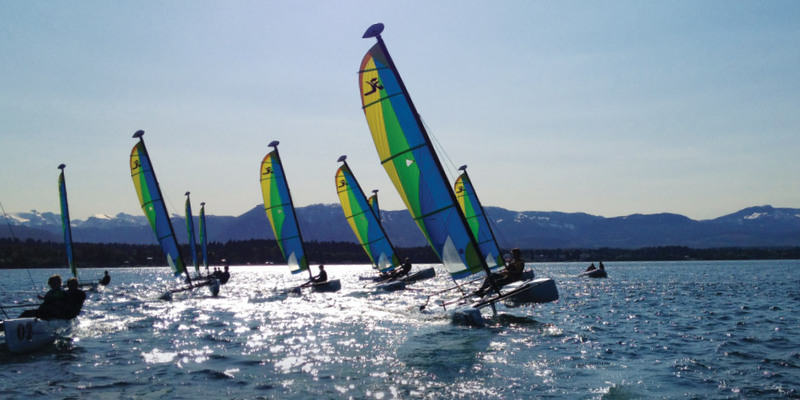 As this beach culture grows, more people are choosing ocean sports as their go-to and the Comox Marina as their starting point.